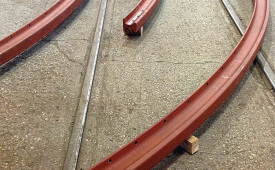 Oakley Steel was contracted by a bulk material handling customer to supply the custom fabricated curved rail shown here. 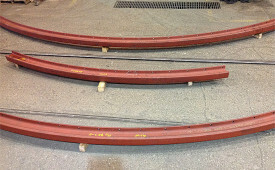 This rail is composed of carbon steel, and was formed utilizing our Rollform section bender. 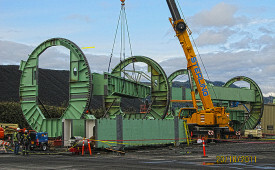 This system employs processes such as rolling, bending, forming, and curving. Saw trimming and drilling were also carried out to achieve the required profile and specifications, all of which met tolerances of ±1/8”. Each finished rail weighed 175 lbs., with a total of 10 tons of railing being supplied to the client. This product is shipped to various parts of US and Canada, with a turnaround of only 2 weeks. We have the multiple facilities and extensive lines of equipment to provide custom steel members for projects of any scale. This allows us to bend steel to exacting specifications, specialty bend profiles. Our products and processes meet the highest industry standards, earning our reputation for excellence. For more information about this curved rail project, or any of our other steel manufacturing capabilities, please see the table below or contact us directly.